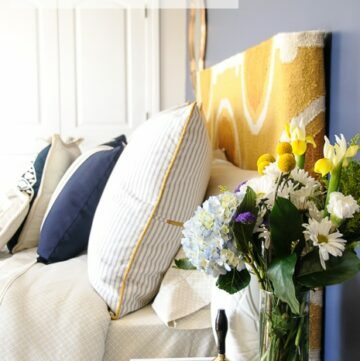 Today I’m going to share with you some Guest Bedroom Decorating ideas. 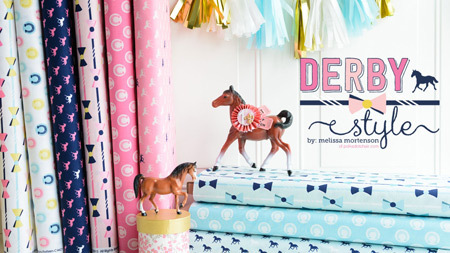 If you like this post you may also want to see how the room turned out! 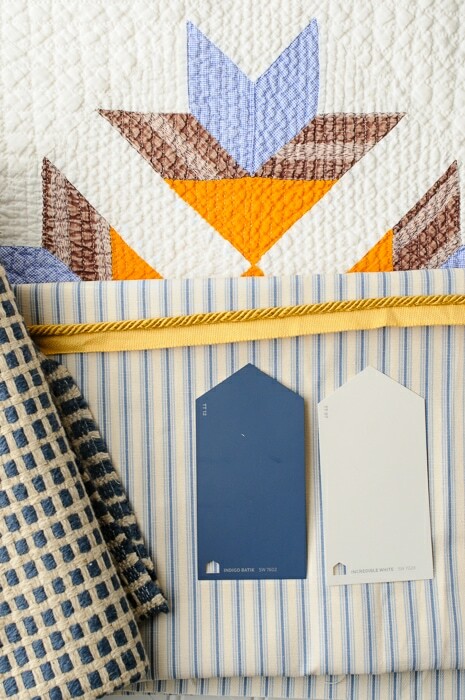 Check out this post for the Navy and Gold Guest Room decor reveal. Shall we talk about the current state of my guest bedroom? Sigh… I don’t know if I’ve got the energy to address its current “state” right now… first let me back up a bit. Living a good 3 days’ drive from most of my immediate family has taught me one thing over the years, visitors are always welcomed and hopefully arriving at regular intervals. For this reason we’ve always tried to have a guest bedroom or a guest “area” of our home. At our last house it was just 2 extremely comfortable sofas in the basement and a separate bath. Before that it was a “my kid’s room is now our guest room”… but we always managed to find space for everyone. This is my current guest room. I cleaned it up for this picture. The room doubles as my blog photo studio, there’s a bunch of crap behind the camera you can’t see. It’s got a lot going for it, great light (even though it’s in a basement) and even though it’s a bid oddly sized it’s nice and big. It also has 2 twin mattresses leaning up against the wall- what’s up with that you ask? Well, in January we decided that it was finally time to move my almost 13 year old son out of his kiddie boat trundle bed. Yes, I had a 12 yr old in a boat bed- seemed like a good idea to buy it at the time (tip: buy furniture that grows with your kids). Anyway, it was ZERO degrees outside, and I had been trapped in the house for DAYS and was itching to DO SOMETHING- I got the idea that we could move the queen sized bed in our guest room into his room. After a weekend of moving things around we were done! Queen bed to kids’ room- check! In our guest room we were left with a day bed (that had always been in our guest room) and 2 twin mattresses. No big deal right? Well until summer hits and the visitors start flowing in. Think they’d LOVE to sleep in my blog photo studio/junk room? Well, they are nice people and would probably be okay with it, but I’d be mortified. Time to come up with a plan, and enough time to execute it before the first guests show up. 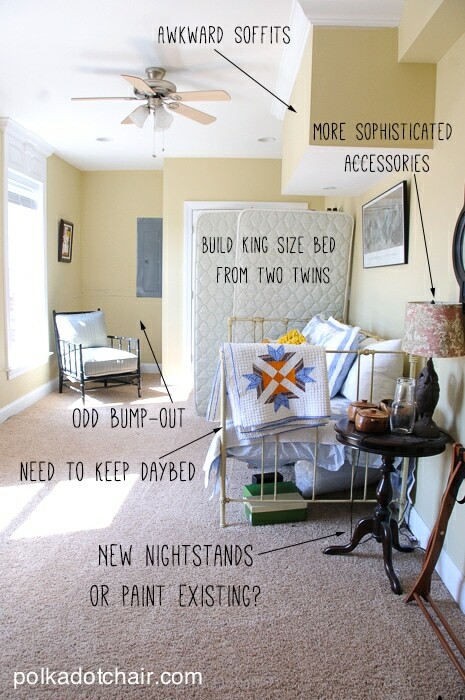 We’ve got several things to think about in that room with all of its odd soffits and nooks. Even before we moved out the bed it was never really “decorated,” just the room that all of the “extra” stuff went into. When we finished the basement we painted it a nice neutral color, bought a bed and said it was “good.” Now that we need a new bed, it’s time for a redo and a PLAN this time. Not just a room to hold all of our hand-me-down furniture. Since it’s in our basement, there are several soffits to worry about. Strange angles and such. One of them we fixed when we built the room, by adding night lights to the bottom. This is where the new bed will be. Even with the lights the soffits are an eyesore (but must stay)…I wasn’t sure how to deal with them, then I saw this photo on the HGTV HOME™ by Sherwin-Williams Traditional Twist color brochure and went “aha”!! That dark color is so elegant and I LOVE IT. Dramatic and elegant, but with a bit of whimsy. The color is a dark charcoal gray…not exactly right, then I noticed in the same color collection a dark navy blue, Indigo Batik. Perfect! 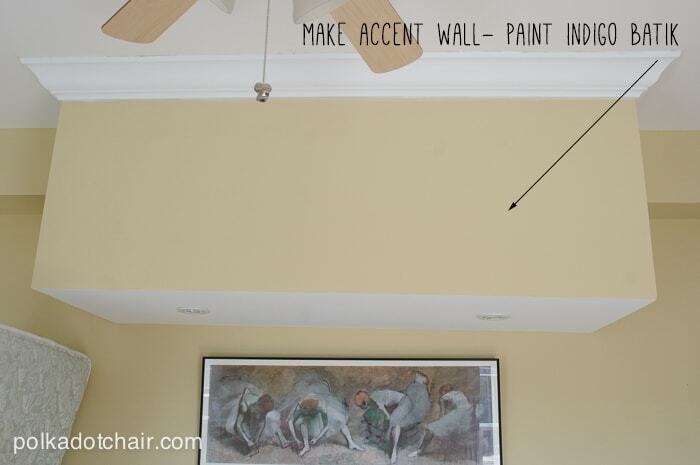 I’ve decided to paint an accent wall on the wall with all of the weird soffits. The dark color will help the wall look less choppy, blending all of the angles together- dark colors are great that way. Going with that same color collection, HGTV HOME™ by Sherwin-Williams Traditional Twist, I zeroed in on a white for the rest of the room, and a gray for a few accents (accessories). With “blue” stuck in my head, I remembered my favorite antique quilt. It’s the one in the first photo- and decided to pull the rest of the color scheme from there. Not wanting to go as marigold as the yellow in the quilt, I got a bit stuck. I knew I wasn’t about to paint a wall orange, but wanted to have a good shade of mustard yellow to use as inspiration as I picked out other bedding and accessories for the room. Then I discovered the COOLEST THING EVER! The Chip It!® color selection tool by Sherwin-Williams. I’m seriously addicted to this thing- Have you guys ever seen a photo of a room online on a magazine website, blog or Pinterest and loved it, wanted to use it as an inspiration piece, but then didn’t know what to do next? Well, Chip It!® totally solves that for you. All you do is install the Chip It!® button on your browser (kinda like the Pinterest pin it button), then when you see a photo you like, you click the button, hover over your image, and VOILA, a perfectly coordinated paint color scheme! After playing with that little Chip It!® tool for days, a trend started to emerge. I was able to pick out a few colors from some of my favorite chips, and get an idea going. 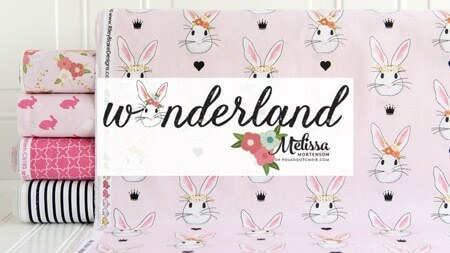 I took a quick trip to the fabric store and FINALLY a PLAN for our guest bedroom. 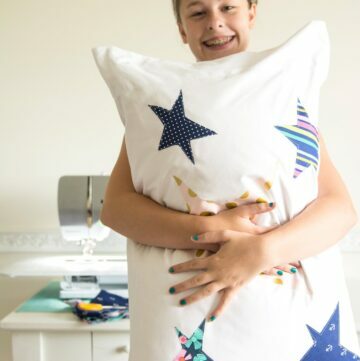 You can even upload your own photo to Chip It!®, which is what I did after I pulled together my inspiration fabrics. Even though I didn’t pick those exact colors on the chip, it helped to reinforce my idea for the color scheme of the room. People, let me tell you, I have been known to look for MONTHS for a paint color. When it comes to color I AM PICKY! I even repainted my daughters room 3 times because the pink had too much blue in it. The fact that I picked TWO for one room in a matter of days is a miracle! My idea for the room is to use the antique quilt on the foot of the bed with a plain white duvet. Then mix in some more modern and sophisticated pieces for a “Modern Country” style room. The dark blue accent wall and clean lined furniture will help keep the room from feeling too “country” but still give it a warm and inviting feeling. I don’t want anything overly modern for the room. I want our guests to come and feel like they are in Kentucky, not a hotel room in a big city. 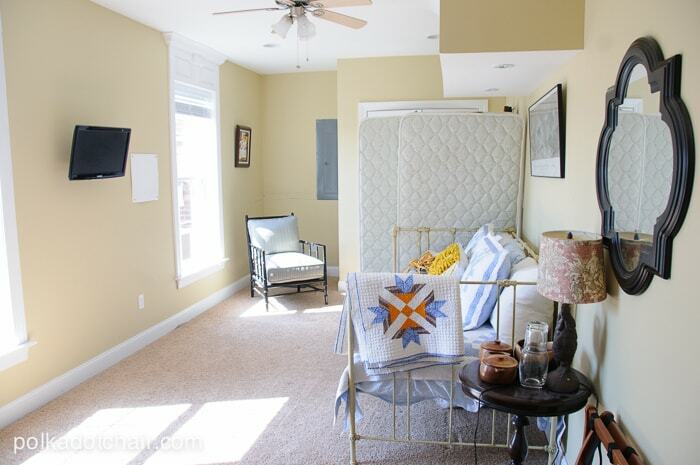 Since it is a guest room, and my guests are essentially on vacation here, I’ll be adding in some local Kentucky art, and decorative elements, along with hiding as many horse-themed elements in the room as I can. To save money, I’m also going to figure out how to make a king-size bed out of two twin mattresses. I have no idea how to do that yet, but I’m sure it will involve a memory foam topper and some sort of platform. I’ll be sure to share what I figure out. My youngest brother is autistic and in his 30s, he lives with my parents and comes with them when they visit. For this reason, I’ll also be keeping the current day bed in the room. That way there is room for 3 to sleep comfortably. 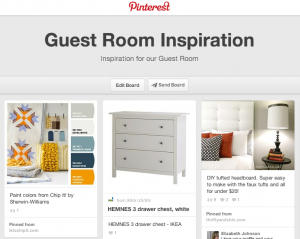 If you’d like to follow my progress with gathering ideas for the room, follow my Guest Room Pinterest board. 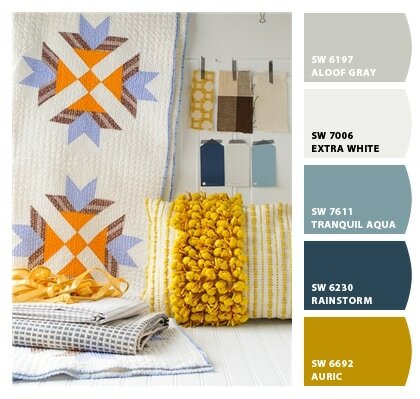 and, for even more color and decorating inspiration you can follow Sherwin-Williams on Pinterest, Facebook or Instagram. Now that you’ve listened to me rattle on about my Guest Room, let me ask YOU: What room in your house would you want to make over using the Sherwin-Williams color selection tools? 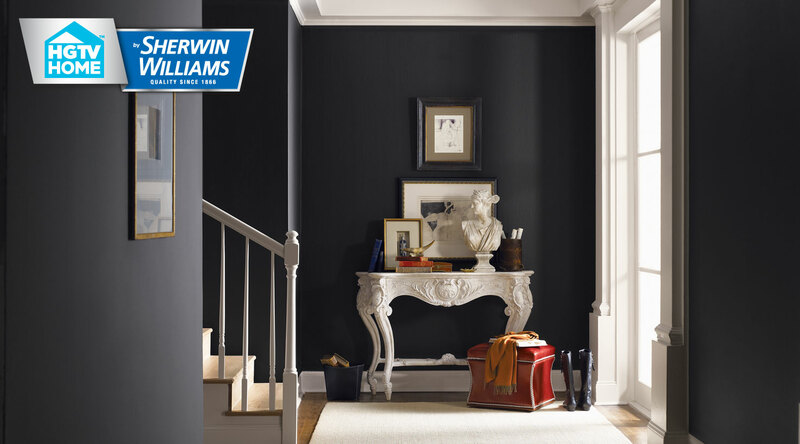 Leave a comment here and you’ll be entered to win a $50 Sherwin-Williams gift card! This sweepstakes runs from 5/12/2014-6/1/2014. I need to repaint our family room. I love the other, but after living with it for a few years it just feels too cold. I love the batik blue for your room, stunning. AHHHHH! I didn’t proof read!! I love the color, not the other. Oops. I would love to finally makeover my master bedroom. 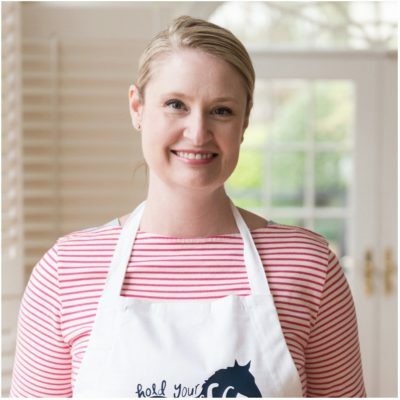 I would love to make over the kitchen if I won this one thanks for the chance. 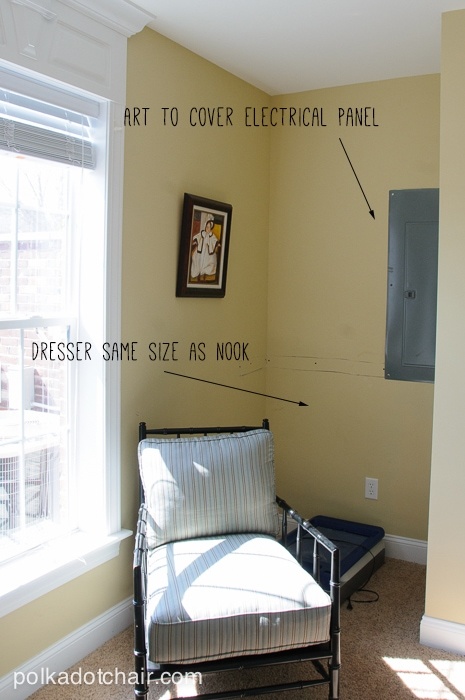 It’s a toss up between a sad guest room and a sad mud room /entryway. Both are 70s fabulous and in desperate need of a makeover. I need to paint my master bedroom closet. I need to update my upstairs bath. I would love to make over our living room! The Collonade Gray! 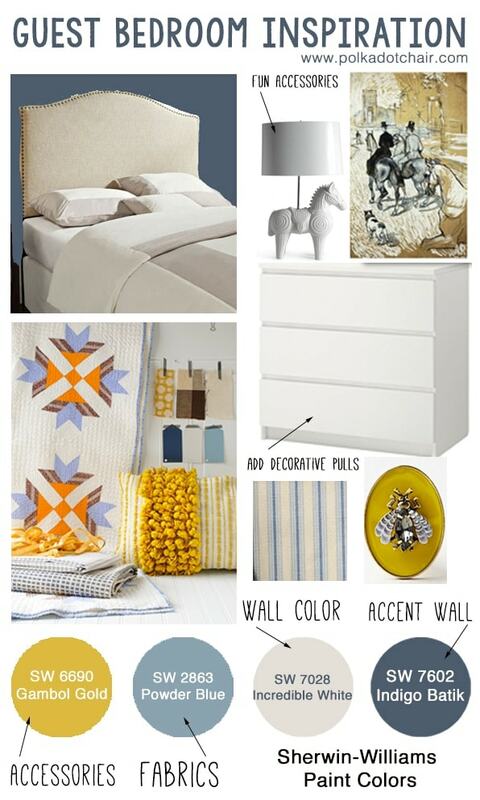 Who knew I would find the bedroom paint color I have been pondering for over 8 months on your blog post! Thank you so much! I guess it would be obvious, that if I won the gift certificate, I’d be buying a gallon of the above mentioned color and finally have a calming bedroom for peaceful dreams!! We are renovating our master bedroom this summer, so this would be perfect! Thank you for this giveaway! I would love to makeover my living room. I just moved into a new apartment and the walls are bare and I have no paint on the walls. I need some new furniture too! I tweeted under @yarbr012 https://twitter.com/yarbr012/status/466275814137688064. I would LOVE to paint my bedroom! I’ve been pulling old wallpaper off, that had been painted over. This leaves behind a layer of paper that is very old and not very pretty. I would love to create a space that my husband can relax in. Thank you for the chance! 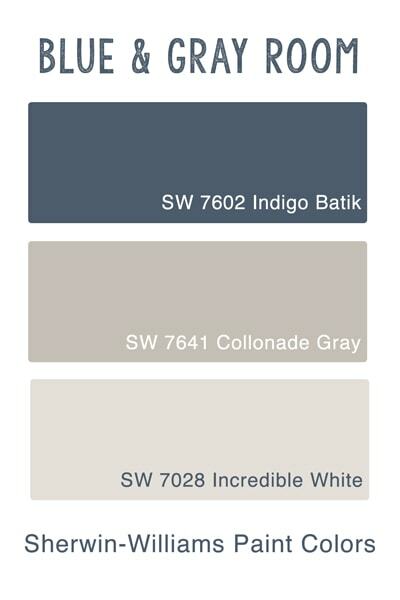 I am trying to pick a new color for our dining/living room wall. It currently has SW Halycon Green, but I’ve repainted other walls in the room and it needs something else. I also take my time in picking out colors. The natural lighting in our house is odd and the colors never looks as they do in the store when on my walls. My bedroom needs a make over really bad! I’m not good at picking colors either. Right now yellow, gray and black sound pretty. 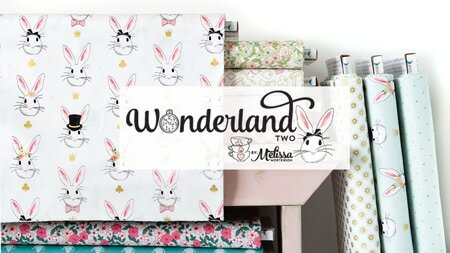 I WOULD LOVE TO REDO MY SEWING ROOM AND/OR OUR BEDROOM. I would love to paint our master bedroom. I kind of want a dark color, but the room itself is pretty dark so I need to figure that out. 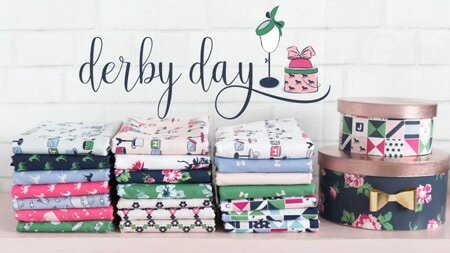 I’m not commenting to win, but commenting to beg you to do a quilt along to teach me how to recreate that quilt! My Dad’s room, he died three years ago and besides moving some of the furniture out it’s just sitting there becoming the catchall eyesore room! My sunroom could use a total makeover. I would love to make over my children’s playroom, its a very bland color and just not an inviting space for them to play in! The kitchen needs a makeover at my house. I’d like to makeover the kitchen. I have a LR/DR and all I want is to make it more airy, open and tropical. Needs a total makeover. The only thing I like in that room is an old poster from the Coconut Grove art festival. Love how you have a plan. Great post! Been reading a lot about designing my guest room. Thanks for the info here! I would like to makeover the kitchen. I would like to use the tool to makeover my living room. I would makeover my living room. 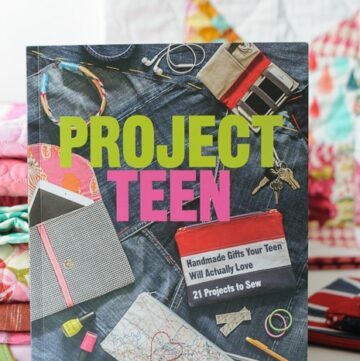 So many projects – where to start?? I would probably start by painting my oldest son’s room. 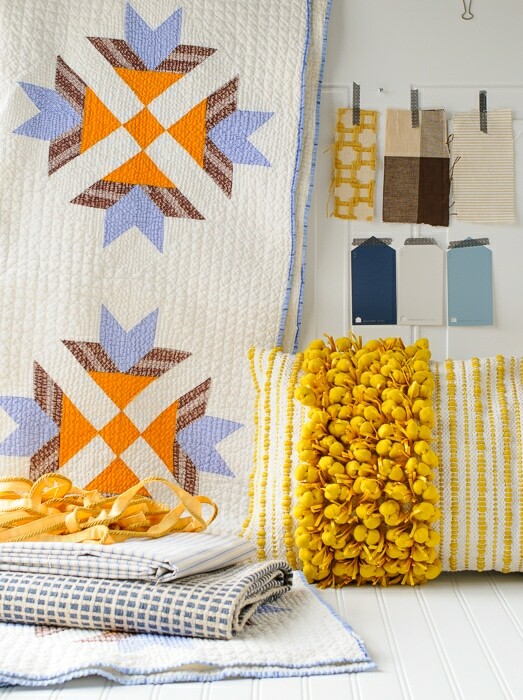 I can’t wait to see your finished guest room!